Jason Isbell has announced a new festival in his native Alabama. 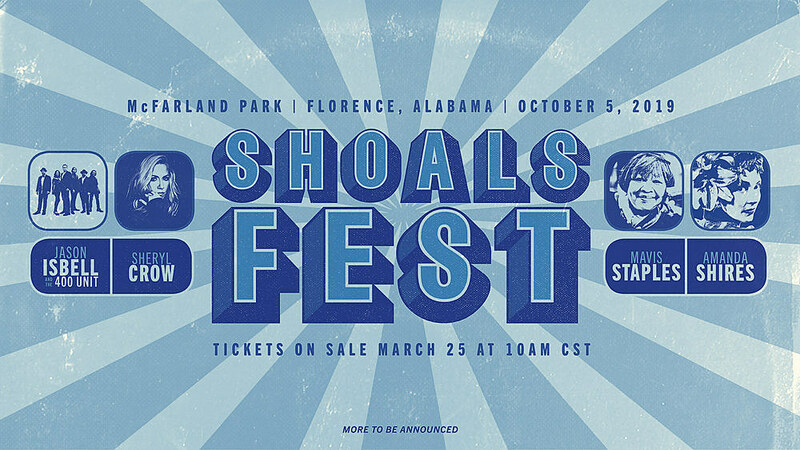 Shoals Fest is set to happen on October 5, 2019 at McFarland Park in Florence, AL, and tickets go on sale Monday 3/25 at 10 AM CST, with local presales happening in Muscle Shoals, AL and Birmingham, AL on Saturday 3/23 at 10 AM. Along with Jason Isbell and his band The 400 Unit, the Shoals Fest lineup also includes Mavis Staples, Sheryl Crow, and Amanda Shires, with more artists to be announced. Speaking of Sheryl Crow, in addition to her upcoming tour dates with Heart this summer, she’s also announced a NYC headlining show, on July 28 at The Rooftop at Pier 17. Tickets go on sale Friday 3/22 at 10 AM, with various presales starting Tuesday 3/19 at 10 AM. Sheryl has another NYC appearance coming up too, as part of the 2019 Tribeca Film Festival, where she’ll perform after the Linda Rondstadt: The Sound of My Voice premiere screening.